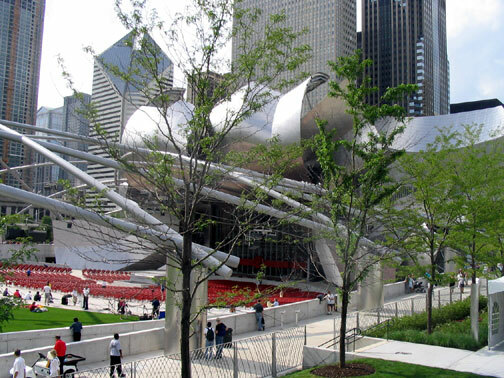 A irreverent photo essay on Frank Gehry and his dazzling Pritzker bandshell in Millennium Park, Chicago's stunning new downtown showplace. 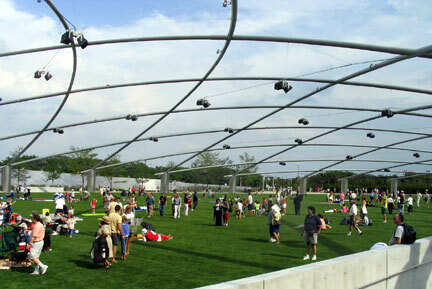 The Pritzker Pavilion on opening afternoon, Friday, July 16th, 2004. The huge ribbon across the the sliding glass doors of the stage was cut by steroid-stuffed bodybuilders wielding giant scissors that they were told, emphatically, not to run with. (Okay, actually the ribbon was pasted to the doors and "cut" by being pulled apart when the glass doors opened to the sight and sound of the Grant Park Orchestra, conducted by Carlos Kalmar, playing a Richard Strauss' fanfare, but is that anywhere near as good a story?) 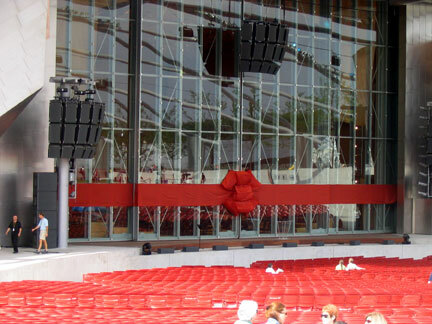 The glass doors can also be kept closed to be able to use the stage for events in winter. 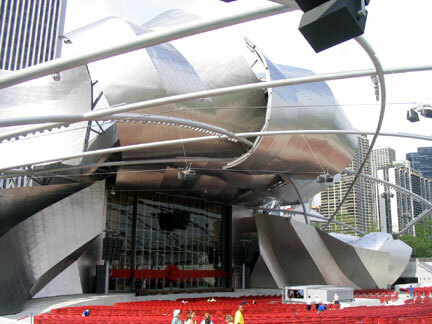 The Jay Pritzker Pavilion, designed by Frank Gehry, is the new home for Chicago's Grant Park Symphony, which for nearly seventy years has been providing free summer concerts in downtown Chicago. 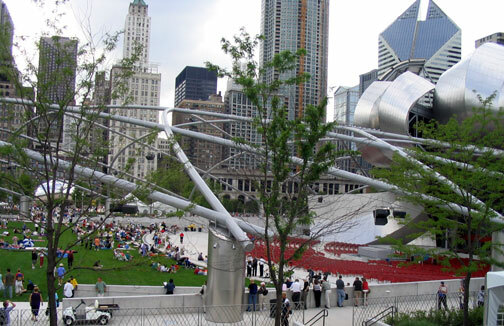 The name of the bandshell refers to Chicago's Pritzker family, owners of Hyatt Hotels and the Marmon Group. 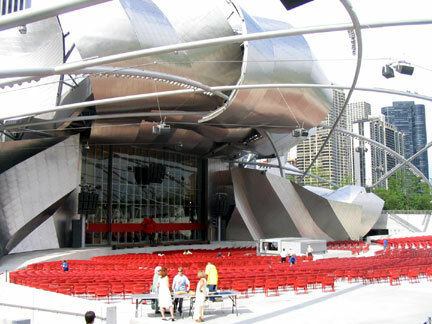 Cindy Pritzker was instrumental in insisting that Gehry be brought to Chicago to design the new bandshell, the architect's first building in the city. The bandshell, built atop a sublevel muncipal parking garage, is the centerpiece of the city's new $475,000,000 Millennium Park, which was itself constructed partially on the site of an older park that had fallen into massive disrepair, and partially over tracks that were originally built by the Illinois Central Railroad in the early 19th century and that had remained, until Millennium Park's creation, an open trench that separated Michigan Avenue from the city's lakefront. The bandshell has seating for 4,000, with room for another 7,000 people on the broad lawn behind the fixed seating. The site of the old bandshell, which remains the location for the city's fourth of July concert and numerous pop music festivals, was in most places little more than clumps of grass isolated in great expenses of dirt - a heavy rain and it was Woodstock redux. 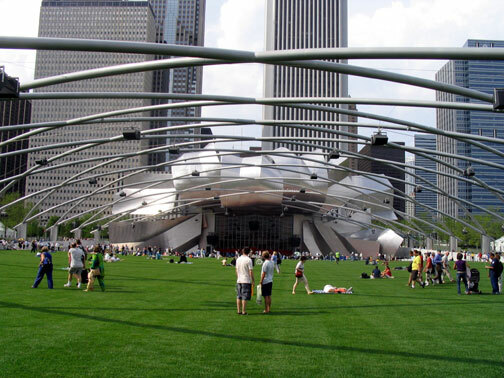 At least for now, the great lawn of the Pritzker pavilion is a thick uninterrupted carpet of newly laid sod. A trellis consisting of a cross-stitched sweep of curving steel pipes stretching across the entire width of the seating and lawn areas, defines it as a distinctive space and provides mountings for speakers used by the pavilion' sound system. 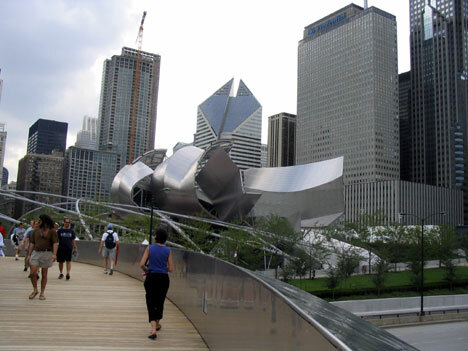 The first design to come from Frank Gehry was a more austere homage to another great Chicago architect, Mies van der Rohe, designer of Crown Hall on the Chicago's IIT campus and the Seagram Building in New York. Mies was known for the dictum "Less is more" and for seeking to employ modern technology to create an architecture of "almost nothing" - simple, minimal and direct. Gehry's Chicago client rejected that initial design, and it can be argued that they were less interested in drawing on the full power of Frank Gehry as one of the most innovative and creative architects of our time than they were in getting a Chicago copy of the trademark shiny billowing forms that have helped make his Guggenheim Museum in Bilboa, Spain and Disney Concert Hall in Los Angeles instant tourist sensations for their respective cities. 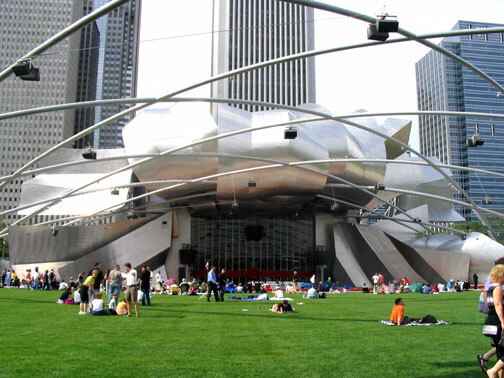 The Chicago bandshell draws heavily on a previous Gehry proposal for rebuilding the deteriorating Hollywood Bowl (the clients in L.A. were even more conservative, and opted instead to incorporate necessary upgrades in a new bandshell that's basically a replica of the one it replaced.) Early on, the great clock of billowing steel that wraps around the stage area was referred to as the "mane", which would have been a perfect simile to MGM's famous Leo the lion, but whose relationship to architecture in Chicago is much more tenuous. Gehry has admitted that while the lower portion of the billowing forms serve to reflect sound out towards the audience, the upper portion is purely decorative. 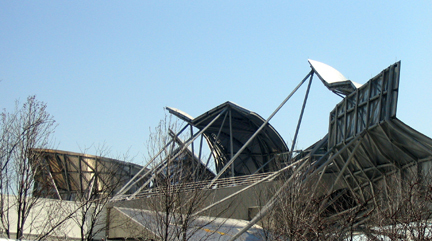 Gehry's most direct expressive link to the Chicago's historic architecture is actually along the Pritzker pavilion's back elevation. The way he leaves the support structure for the billowing forms exposed both echoes his unshamed use of abject materials like chain link fence in his Santa Monica home, and also evokes the iconic way that, in much of the best of Chicago architecture, form frankly expresses structure. 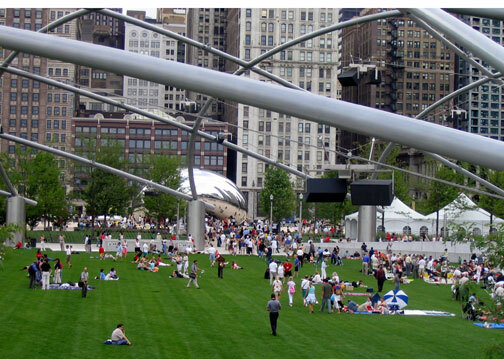 All caveats are forgotten, however, in the way the Pritzker Pavilion succeeds - ecstatically - in carrying out Gehry's stated goal of creating an architecture that evokes joy. 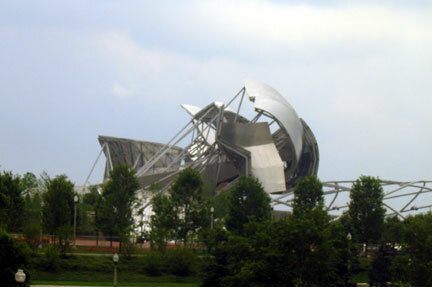 Although Gehry finds the strongest affinity to his work in a number of modern painters, he can also be said to have taken Goethe's description of architecture as "frozen music" to heart. Like Rem Koolhaa's new student center at IIT, he's rejected Miesian austerity in favor of what could be called a new "techno-baroque," which breaks free from rigidly linear forms of Miesian architecture - where the eye can take in the simple, streamlined whole in a single glance - to using contemporary technology to create a modern equivalent of the exuberance of a Baroque church, where sweeping, curving forms and ornate details invite the eye to a long and varied journey of visual delight. 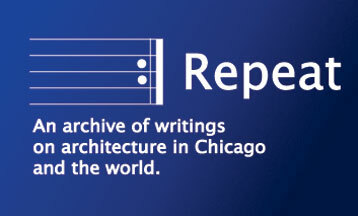 Mies's architecture has the puritan purity of Bach, Gehry's work is is more like Vivaldi, teaming with an Italianate love of energy and high spirits. 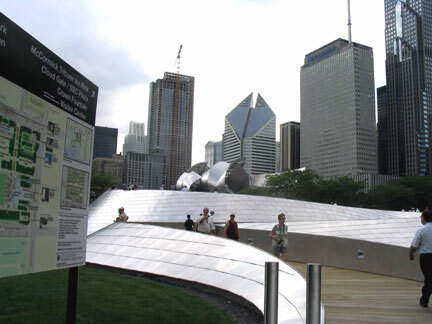 Frank Gehry also designed the BP Bridge, a snaking stainless steel structure, with natural wood surfaces, that spans and shields the Pritzker Pavilion from the noise of Columbus drive, which runs directly east of Millennium Park, and connects it to other parkland that directly abuts the Chicago lakefront. East entrance to the BP bridge. Millennium park entrance to the BP bridge. Looking toward the Pritzker Pavilion from the BP bridge. Walking along with the tens of thousands of people coursing through Millennium Park on this, it's opening day, with even the curmudgeons taking unguarded delight not only in the dancing forms of Gehry's bandshell, but in taking pictures of their reflections in Anish Kapoor's Cloud Gate sculpture, and watching their kids run barefoot through Jaume Plensa's Crown Fountain, you feel there may actually still be hope for a successful resistance to the soul-crushing banality of the city's blight of new concrete condo and office towers, and the suburb's devolution into a dehumanized landscape of cinder-block, warehouse-stupid, big-box retailers. 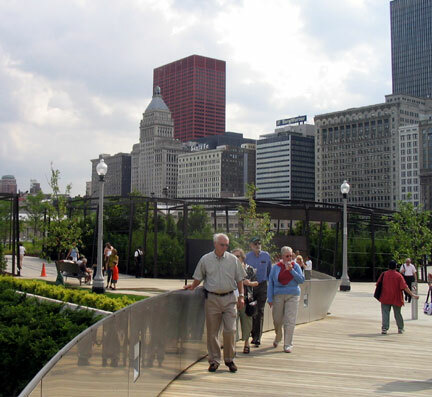 The unquestioning worship of a market economy that reduces everything in its path into a commoditized widget is held at bay, the bean-counters momentarily repelled (and at $475,000,000, including massive budget overruns, Millennium Park represents a lot of beans.) The experience of a great city, freely and joyfully shared and enriched by its citizens, again seems a possibility. © Copyright 2004 Lynn Becker All rights reserved.